Generally, I am interested in the social life of law as it is carried out by those who enforce it and as it is experienced by those who are its targets. My three principal areas of study include the Mexican immigrant experience in the U.S. and their social movements, Latino Border Patrol agents, and city gang police. My peer-reviewed journal articles and other work are listed below. If you are not able to access the full text through your institution, for instance, please email me. Everyday life as an immigrant in a deportation nation is fraught with risk, but everywhere immigrants confront repression and dispossession, they also manifest resistance in ways big and small. Immigrants Under Threat shifts the conversation from what has been done to Mexican immigrants to what they do in response. The social movements that emerge are shaped by the local political climates in which they unfold and remain tethered to their material inspiration. 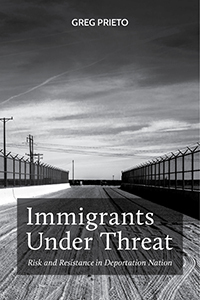 Immigrants Under Threat explains that Mexican immigrants seek not to transcend, but to burrow into American institutions of law and family so that they might attain a measure of economic stability and social mobility that they have sought all along. Profiled in: The Santa Barbara Independent & the Mobilizing Ideas blog (Notre Dame). 2016. “Opportunity, Threat, and Tactics: Collaboration and Confrontation by Latino Immigrant Challengers.” Pp. 123-154 in Narratives of Identity in Social Movements, Conflicts and Change (Research in Social Movements, Conflict and Change, Volume 40), edited by Landon E. Hancock. Abstract: Drawing on 61 interviews with Mexican immigrants and ethnographic participant observation conducted over three years, I compare social movement organizing in two cities in one California County: one more progressive and the other more repressive. I profile two campaigns waged by Mexican immigrants and their allies in response to two threats posed by police: (1) car impoundments of undocumented, unlicensed drivers’ vehicles and (2) police killings. As political process theory was extended to authoritarian settings, scholars have demonstrated that both growing political opportunity and threat stimulate mobilization. Building on this trend in the literature, this study’s contribution lies in its specification of the relationship among political opportunities, threat, and mobilization tactics. I argue increasing local political opportunity gives rise to more collaborative protest tactics, while relatively more threatening environments yield more confrontational tactics. Because opportunity and threat are not objectively assessed, nor do they automatically inspire protest, I also consider the role of state targets, formalized SMOs, and the influence of coalition partners on tactics. Ethnographic methods are particularly useful for understanding the way organizers and activists, from within organizations that favor distinct tactical repertoires, perceive and attribute threat and opportunity, shedding light on the micro- and meso-level dynamics that shape the social form of mobilization. 2015. “‘Traitors’ to Race, ‘Traitors’ to Nation: Latina/o Immigration Enforcement Agents, Identification, and the Racial State.” Latino Studies. Abstract: Latina/o immigration enforcement agents, who represent 52% of all US Border Patrol agents, are often confronted with the accusation “traitor.” Drawing on ethnographic observation and in depth interviews, I argue that this term reinscribes the boundaries of a normative Latina/o identity constituted, in part, by a transnational racial solidarity. At the level of identification, “traitor” draws at least two responses from Latina/o agents. Some assert that their “connection” to the migrants they police leads them to engage their work more humanely than their fellow agents. Other Latina/o agents, by contrast, profess a primary commitment to the inviolability of US national boundaries. Both approaches, however, reinforce the hegemonic racial state. The racial and ethnic diversity of the ranks of US immigration enforcement, combined with the adoption of a more humane approach by some agents, helps to defend the US government against charges of racism. This study illuminates the multiplicity of Latina/o racial identities and the functioning of the contemporary racial state in a supposedly “post-racial” era of diversity and nominal inclusion. Camacho, Michelle, Marie Sarita Gaytán, & Greg Prieto. 2014. “Diversity in the Academy: On the Growing Prominence of Race and Ethnicity in the Pacific Sociological Association, 1929-2014.” The American Sociologist 45(2): 301-381. Abstract: This article examines issues related to the underrepresentation of faculty of color in higher education, with specific attention to the discipline of Sociology and the Pacific Sociological Association (PSA). The authors explore the role that professional organizations such as the PSA have played in promoting racial and ethnic diversity within the Sociology pipeline. Further, it provides an analytic overview of the history of conference presentations on the topic of race and ethnicity within the PSA over the last eight decades. The article proceeds in three major parts: First, is an outline of the contours of the problem of racial underrepresentation in the academy. Next, follows a content analysis of PSA programs, which indicates that race continues to be of central importance to the PSA and that the 1970s were a turning point when the PSA began to examine its role in promoting diversity in the discipline. Finally, mentorship is presented as a critical vehicle for promoting greater racial equity in the PSA and the discipline of Sociology more broadly. Earl, Jennifer, Katrina Kimport, Greg Prieto, Carly Rush, and Kimberly Reynoso. 2010. “Changing the World One Webpage at a Time: Conceptualizing and Explaining ‘Internet Activism.’” Mobilization: An International Journal 15(4): 425-446. Abstract: Researchers studying Internet activism have disagreed over the extent to which Internet usage alters the processes driving collective action, and therefore also over the utility of existing social movement theory. We argue that some of this disagreement owes to scholars studying different kinds of Internet activism. Therefore, we introduce a typology of Internet activism, which shows that markedly different findings are associated with different types of Internet activism and that some types of Internet activism have been studied far more frequently than others. As a consequence, we ask an empirical question: is this skew in the selection of cases, and hence apparent trends in findings, a reflection of the empirical frequency of different types of Internet activism? Troublingly, using unique data from random samples of websites discussing 20 different issue areas commonly associated with social movements, we find a mismatch between trends in research cases studied and empirical frequency. “On the Phone, On Campus, On the Market: Demystifing the Academic Review Process” Pp. 39-51 in Beginning a Career in Academia: A Guide for Graduate Students of Color, edited by Dwayne Mack, Elwood Watson, and Michelle Madsen Camacho. Routledge. “The Shell: An Ethnographic Analysis of Mexican Immigrant Agency.” Pp. 250-263 in The Nation and Its Peoples: Citizens, Denizens, Migrants, edited by John S.W. Park and Shannon Gleeson. Routledge. Prieto, Greg, Chandra Russo, Howard Winant. 2012. (Mis)Trusting the Police: Gauging Levels of Confidence between the Latina/o Community and the Santa Barbara Police. UC Center for New Racial Studies. 2014. “Re-envisioning Education for All: A Summit for the Academic Achievement of Latino/a Youth, Summit Full Report." Reticence and Resistance: The Everyday Politics of Immigrant Life in the Deportation Nation (under contract with NYU Press). The Immigration Debate: The Legal Production of Immigrant ‘Illegality’ (under contract with Routledge Press). Rios, Victor & Greg Prieto. “Mano Suave, Mano Dura: Drift among Police Officers in their Interactions with Disreputable Youths” (article manuscript in progress). Desbordando el Bordo / Unpacking the Canal: Pilot Survey of Deported Migrants in Tijuana (community partner: Fundación GAIA). Research supported by: USD Office of Undergraduate Research Community Based Research Development Grant.